SAL Heavy Lift announced the completion of one of its most challenging projects: the crew of MV Svenja has installed an offshore development platform over a subsea gas well conductor in Alaska's Cook Inlet. It is the largest exploitation area in Alaska’s Cook Inlet – surrounded by active volcanoes and extremely strong tidal currents. “Kitchen Lights Unit # 3” is exposed to a tidal range of 25 feet which provokes currents in excess of 5 knots. And here SAL Heavy Lift faced one of the most challenging missions in its 35 years of history. In March 2015 MV Svenja was chartered for the installation of the offshore development platform within the petroleum and gas exploitation area operated by Deutsche Oel & Gas AG on 337 square kilometers. 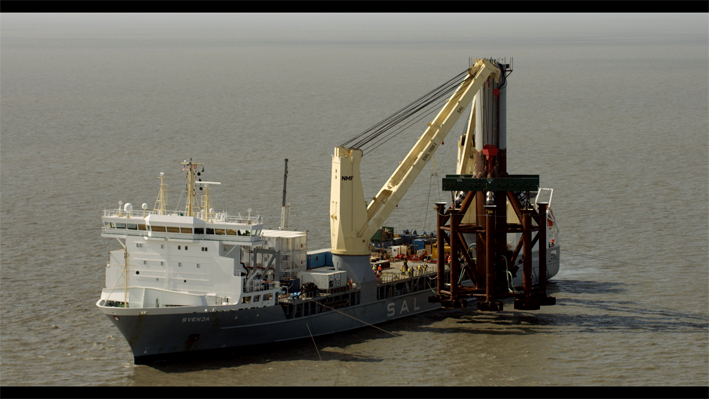 The area posed major technical and operational challenges for SAL Heavy Lift within the installation. Planning and preparation over great distance. 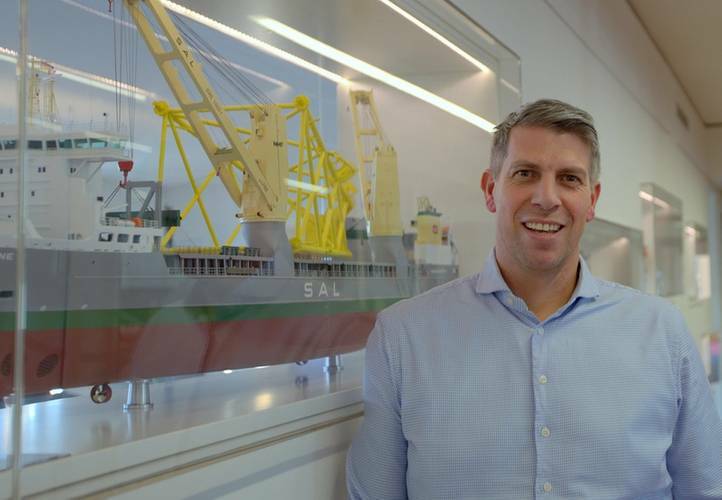 “A very short preparation time for the project between signature and start of installation of approximately three months was very challenging,” said Holger Krenz, responsible Project Manager at SAL. “We managed the work across at least three time zones and with a maximum time difference of 17 hours. 15 specialists of SAL planned the construction and installation of the platform, designed a special mooring arrangement for the vessel, drafted the temporary living quarters onboard the MV Svenja and accompanied the project steps in detail – from scheduling over cost-controlling to vessel stability calculations, rigging design and lifting procedures. 25 SAL colleagues and a team of 58 experts from Crowley and sub-contractors did rely on the most accurate preparations for the later installation onboard the vessel. After mobilization in Singapore MV Svenja set off to Alaska. 14 days of sea passage later she had to get secured on-site by a two and a half days operation. Ten pre-installed anchors on the seabed corresponding with ten additional winches onboard were necessary to ensure solid positioning in choppy sea with strong currents at the Cook Inlet. This was furthermore needed in order to comply with the Jones Act, which rigidly restricts the usage of foreign vessels within U.S. territorial waters. Further- more all tasks within the installation were restricted by a tight time schedule. Only during high tide installation windows were open for about four hours. Precisely moored, the installation crew first had to drive the King Pile into the seabed - close to the wellhead, a connection piece standing out four meters out of the ground in a water depth of more than 30 meters. The King Pile worked as a guide to lower the Monopod safely onto the wellhead. A high precision operation with an 80 tons heavy hydro hammer. In the next step the 1100 tons Monopod got transported to MV Svenja by a barge and then lifted onto her deck for additional preparation. Subsequently the two 1,000 tons cranes of the MV Svenja lifted the Monopod off the vessel and lowered it down to the seabed. A very challenging task: The crew had to “thread” the Monopod, a 45-meter high steel base, exactly over the wellhead – without underwater visibility and by a complex lifting arrangement. Once the Monopod reached under the waterline the crane commander lost visibility of the unit. So the crew had to fully rely on a subsea 3-D-sonar-system, displayed on separate monitors in a special survey container. 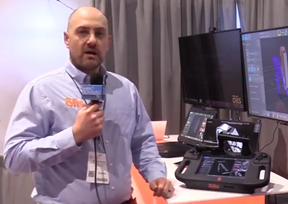 “There was a lot of team play necessary between the survey crew and our lift supervisors. And I would like to highlight that the team was the main aspect that made the whole project successful,” said Sebastian Westphal, Master of MV Svenja. Once the Monopod was landed and the cranes freed, eight piles were driven through guides on the Monopod securing into the seabed. Subsequently the eight piles were to be filled with concrete. Moreover, the piles were compiled in parts, as the required total length of 90 meters could not be lifted with the cranes. Therefore a special setup was created where the first part of a pile was driven into the seabed and the second part was welded on top of the first part and so forth. In early August the engineers installed the 671 tons Topside onto the Monopod with a 700 tons single hook lift. “The Topside installation was an extremely tight lift with very small tolerances,” said Rüdiger Bauer, Captain. During the high tide there was only an installation win- dow of about four hours for lift piling sequence including welding operations. Careful planning, exact execution and a lot of teamwork from a lot of places was necessary. Each move had to be spot on. For the installation a very large barge carrying Topside and Helideck lay alongside MV Svenja with only 2.5 meters clearance to the Monopod. Due to the crane out- reach it had to be moored that close – with the additional challenge not to touch any of the many mooring lines, that kept MV Svenja in position. The Topside was lifted from the barge onto the Monopod. Limited access within the installation and the short time frame made the insertion of the Topside into the guides even more challenging. “We installed the Topside within two hours from lift off from the barge until set-down on the Monopod,” added Bauer. The crew completed the platform installation by installing the 40 tons Helideck. Although they carried out this part by a rather simple lift, it still demanded proper planning due to the lifting height and the placement of the unit’s balance point. At the end of August, after 90 days on-site, the whole installation was completed and MV Svenja headed back to Singapore for two weeks of demobilization. “SAL was our primary heavy lift contractor for the highly technical and environ- mentally challenging job,” sums up Michael Johnson, Statement Project Manager of Crowley: “SAL’s technical calculations and engineering constructions, their vessel and the team’s operational experience on land as well as onboard led to a very successful installation.” Holger Krenz is satisfied as well: “SAL is very pleased to have been chosen to undertake the highly technical and complex installation of the offshore platform for our client Crowley. In this project SAL has been able to make excellent use of its specialist knowledge and capabilities to the advantage of our client with the result that a safe and successful project was delivered." The first natural gas will be produced from the Kitchen Lights Unit at the end of 2015.